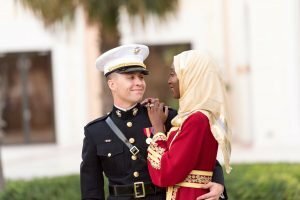 Being a Muslim wife/family in the military…Ooh this is a heavy one. When I was ﬁrst asked to write this, I was excited but also unsure, because I did not want to come oﬀ as negative. However, I do think it’s important to share my experience. I will preface this by saying of course I’m not the only Muslim married to a US Service Member, and all of our experiences will vastly diﬀer. As a Hijabi (someone who fully covers with a headscarf and long gown, called an abaya, at all times), my faith is very visible and the ﬁrst thing most people notice about me. When I ﬁrst met my husband, he was a convert to Islam and a Midshipmen at the US Naval Academy. Marrying someone in the military was deﬁnitely not something I ever thought of. Aside from being part of NJROTC in high school, I had absolutely no aﬃliation with anything related to the US military. Being that he was a student at a service academy, I knew a life of military service was ahead for us. Going into our relationship, I wasn’t really concerned about him being in active duty or about being a military spouse. I think after growing up in the U.S. as a Black immigrant, dealing with bigotry just became a part of life. You pretty much know that you’re going to deal with rudeness and false assumptions from some people; and that also means that you’ll have to put in extra eﬀort to prove those individuals wrong. Upon graduating, my husband was commissioned as a 2nd Lieutenant in the United States Marine Corps and after going through TBS and IOC, he was sent to Camp Lejeune, NC. At this point, we had already decided we were getting married. Two years after he commissioned, we did just that and I moved to Camp Lejeune. I was actually pretty excited to be a military spouse. I love being part of tight communities and community-building, so it was nice to know that there’d be this collective of spouses that I could join (or at least that’s what the internet told me). I also love hosting, so in my head I kept thinking about all of the awesome mixers and dinner parties I would have. I was looking forward to meeting a ton of women, all grouped together based on the careers of our husbands and our common shared experience. Unfortunately, this wasn’t the case. Within the ﬁrst week of us being married, I was already dealing with micro-aggressions. The ﬁrst incident occurred when we went to the DEERS oﬃce to add me into the system. I gave the lady at the counter my Naturalization Certiﬁcate and other requested documents. She then felt the need to tell me, “Welcome to America” multiple times in a snide tone. Essentially, insinuating that I got my citizenship from marrying my husband—despite the fact that the certiﬁcate I just gave her clearly stated otherwise. She then told me that I wouldn’t be permitted to take my photo for my Dependent ID with my headscarf on. Of course, I told her she was wrong as headscarves for religious purposes are permitted in pictures for all Federal IDs, I mean, even active duty Muslim women can wear a headscarf for their ID. She continued to be rude, so my husband and I just decided to leave and come back another day. To say I was upset would be an understatement. I was pissed and if it hadn’t been for my husband’s job, she most likely would’ve received an earful from me. Looking back, I deﬁnitely should’ve reported her actions. Not long after this incident, I think about a week or two later, I had another unfortunate negative experience–this time, it was very embarrassing. I was sitting outside on a bench at the base, reading on my Kindle, and waiting for my husband. I was approached by two Military Police Oﬃcers. Apparently, someone called them and reported that I looked “suspicious.” I’m not sure what’s suspicious about reading on a bench, but of course when you’re visibly Muslim, anything you do can be perceived as “suspicious.” The oﬃcers were pretty nice and left after I explained what I was doing and showed them my ID, but the situation was very uncomfortable and embarrassing. Despite these two incidents, I still set into military spouse life quite easily. I joined the spouses’ page for my husband’s unit and interacted online with some of the other wives. As our husbands were gearing up for a deployment at this time, they were gone a lot for work-ups. I used one of these work-ups as an opportunity to host a small get-together for the unit. I invited the wives in the FB group, cooked a bunch of food and looked forward to meeting some amazing ladies. It was a great night. Not a ton of people came, but the ladies I met that night would become my closest friends during the upcoming deployment. For most of us, this was going to be our ﬁrst deployment, so we were all essentially “learning” together. After my husband left for deployment, I made it a point to get as involved as possible. I wanted to meet people, volunteer, hang out, etc. This led to me deciding to join the Oﬃcer Spouses’ Club (OSC) at Lejeune and becoming a Family Readiness Assistant(FRA) within our unit. When the ﬁrst OSC gathering came up, I was nervous. All of my spouse friends were Enlisted, so I knew I wouldn’t know anyone there. I wasn’t sure what to expect. I showed up, looking flawless as ever. As a Hijabi, I do feel like I need to try even more to look “friendly.” Am I wearing too much black? Does my outﬁt seem inviting? Am I screaming “oppression?” I’m joking, but seriously, it’s a concern. I was excited to see what this group was all about. The event was deﬁnitely diﬀerent than I expected, but I remember one lady there (who I later learned was a GO- General Officer-spouse) came up to me, introduced herself, asked me about myself, how I was ﬁnding the base, etc. It was obvious that she was making the extra eﬀort to welcome me, most likely, because I clearly stood out, and I sincerely appreciated it. I deﬁnitely don’t expect people to do that, but I appreciate it when it’s done. My time as a general member, and later executive board member, at Camp Lejeune’s OSC was great and probably my favorite experience as a military spouse to date. The president that year was the nicest women ever! My tenure as an FRA was also pretty great. My husband’s CO’s spouse at the time was very inclusive and respectful of the fact that as a practicing Muslim, there were certain activities that I couldn’t partake in. When she hosted a brunch for all the FRAs, she was sure to message me about whether or not I could have vegetarian food in a kitchen that had non-halal meat prepared in it (I think she mixed up Kosher standards with halal). She didn’t have to do that. It’s the smart and respectable thing to do, but most people wouldn’t have bothered. Small acts like this always remind me that people are capable of being open and kind, when they’re not ﬁlled with ignorance. While being involved with Family Readiness and in the OSC were great experiences, unfortunately more negativity ensued. It’s really unfortunate how hateful and close minded people can be. A month or so after my husband deployed, I received an e-mail from the spouse of one his superiors about whether or not “Devout Muslims Can Be Good American Citizens” and according to the email, the answer was no and therefore, it was necessary to “destroy” Muslims. Thinking about that email now, is actually infuriating me and it was deﬁnitely sent as some foolish attempt to be aggressive, yet disguised as being inquisitive. It was a forwarded email that apparently was being spread around the service. The email ended with “THE MARINES WANT THIS TO ROLL ALL OVER THE U.S.” This is the kind of fear-mongering that goes on behind the scenes. Around this same time, I posted in a spouses’ FB group about my modest clothing business and another group member commented that I looked suspicious and that the group’s admins should “look” into me. Another awkward and embarrassing moment, but a couple of other ladies who commented in my defense are women I still talk to three years later, despite never knowing them beforehand. I was blocked from my neighborhood’s FB group, also for being suspicious even though I had met one of the Admins IN HER HOUSE just a few days prior to requesting to be added to the group. When it comes to military FB groups, I occasionally like to run “tests” when I’m not accepted into a group or my posts are ignored. It’s almost obvious if you visit my FB page that my husband’s in the military. However, my husband has barely any mention on his page that he’s aﬃliated with the military. So, here is the test: when I don’t get added into a group, I have him request to be added and almost always, he gets accepted. In the past, I’ve also had my non-White, non-Muslim friends post in a group for me, knowing that their posts will be approved and get responses. It pretty much always works. Ignorance and bigotry isn’t only online, though. There’ve been spouses in my husband’s unit who’ve commented about how they didn’t want their husband under my husband’s command, how they weren’t comfortable with him being Muslim and other foolish things. I think this last election (November, 2016) really showed me how truly hateful people are. Ladies who have smiled in my face and have been in my home, were now posting horrible things about immigrants and Muslims on Facebook. Honestly, one of my main concerns when seeing this was “does their husbands also feel this way?” It made me really uncomfortable to think that men who were literally supposed to have his back, could be harboring oﬀensive and obnoxious feelings about his faith and in essence, about him as a person. Just the other day I was telling someone how I hoped that when we PCS’ed, we wouldn’t end up on a base with lots of Islamophobia and they said, “it’s the Marine Corps–of course you will!” And unfortunately, that’s very true. Overall, my experience as a military spouse has been a mixed bag. I have dealt with ignorance and bigotry, but also made amazing connections. There’ve been those who didn’t want to hang out with me because of my faith, but also those who always asked about my prayer times before scheduling a hang out. I’ve met a few other Muslim spouses and unfortunately, only a couple of them are public about their faith. I hope that as our time in the Marine Corps continues, the attitudes towards Muslims and other minorities will change. We are just as integral to this community, as anyone else. Hi! I am Aminat O. OdunEwu-Seese. I own Striving Flawlessly-a lifestyle brand geared towards Muslim women. I was born in Lagos, Nigeria but grew up in Chicago, IL. I am a multi-passionate business owner with a focus on developing myself, growing my businesses, having a fulfilled career and helping others do the same. I enjoy reading, cooking and spending time with my family. You can visit my online modest clothing boutique at StrivingForModesty.Com. Don’t be a stranger-follow me on Instagram: @Lady_Meansie.